HIO architecture, governance and the process by which patients consent to sharing information can have significant implications for participation rates, the value of the information being exchanged and the ultimate success of HIOs. Therefore, states considering developing new HIOs or reconfiguring existing operations should consider the pros and cons associated with different HIO architecture and consent models. Decentralized HIO. 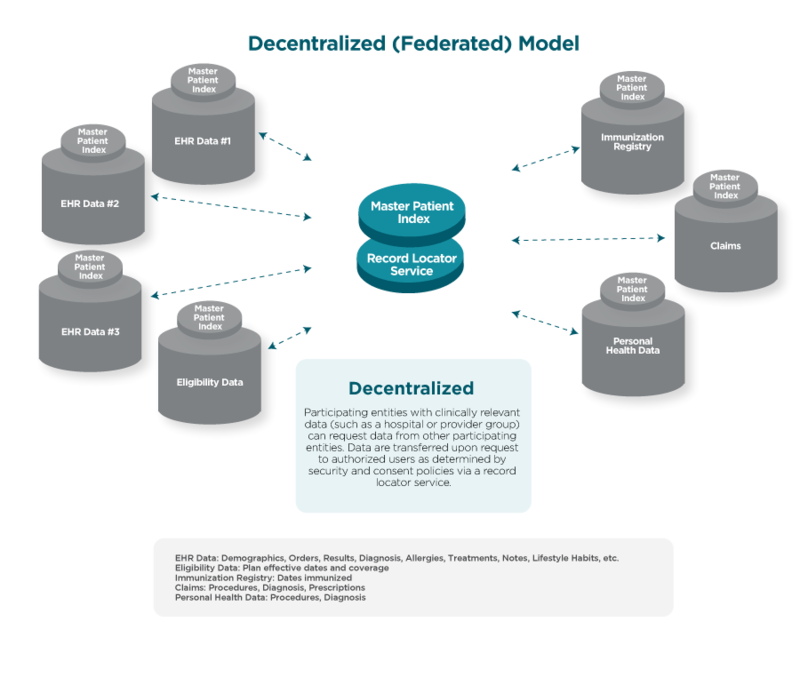 A decentralized HIO facilitates data sharing and exchange among independent databases. It does not store information but rather facilitates the transfer of information between providers without the need for multiple interfaces. Centralized HIO. 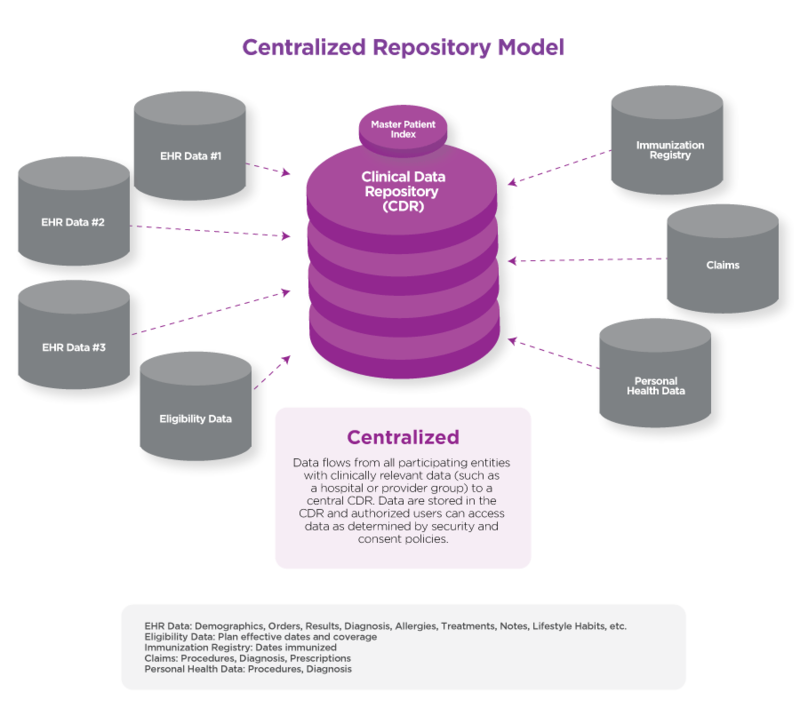 A centralized HIO facilitates data sharing and exchange by collecting and storing information from diverse databases in a central repository. Under the centralized model, data are stored according to defined standards and allow for population-based analytics of shared information. Hybrid HIO. 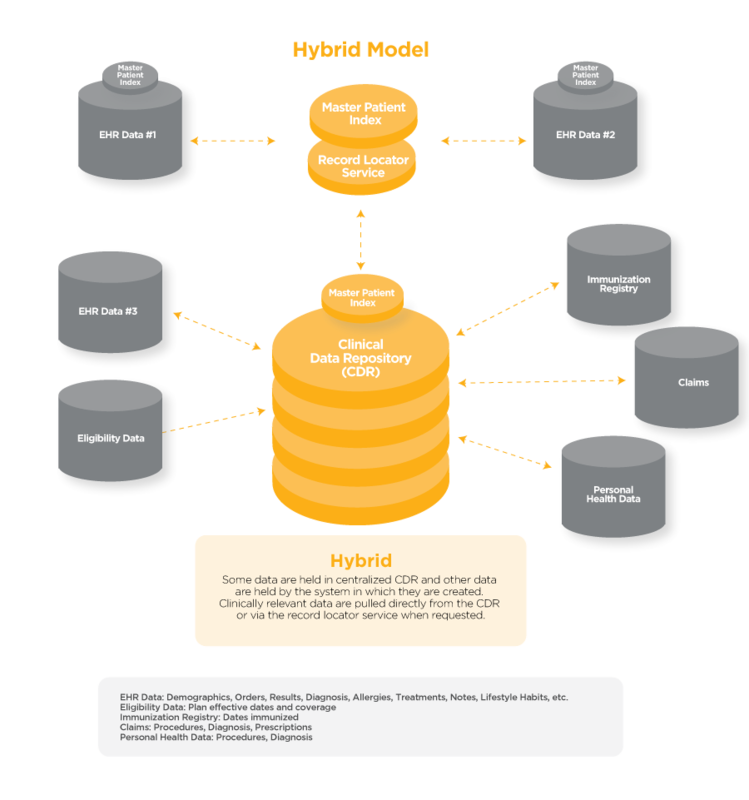 A hybrid HIO incorporates variations of decentralized and centralized architectures. Some HIOs have implemented technological solutions to allow for granular choice, or the ability for patients to individually select the data they do and do not want shared, and have that choice reflected in what providers can view. In addition, states and HIOs sometimes distinguish between “consent to share” information and “consent to view” information. In other words, some HIOs may have one consent policy that governs the basic flow of information to a centralized data warehouse or cloud-based system and another consent policy that governs which providers can access or view data under what circumstances.63 Descriptions of the major types of consent policies that may be required by HIOs, or by states in governing HIOs, as well as examples of states and organizations that have such policies, are discussed below. An opt-in with restrictions model requires patients to proactively consent to allow their health care providers to share their information with an HIO and gives some choice as to who can access their information. For example, in Rhode Island, by law, participation in the statewide HIO is voluntary. Individuals must enroll to have their information shared with Rhode Island’s HIO, the Rhode Island Quality Institute. In addition, patients can choose to allow all organizations involved in their care to access the information, authorize only certain providers or organizations or only allow access to their information in the event of an emergency.